Some of my pain is related to MS (migraines, leg cramps, MS hugs, and L’Hermitte’s). However, most of my pain comes from the rheumatoid arthritis I’ve had my entire adult life. It’s there on a daily basis, affecting the body parts I use the most: my feet and hands. TENS unit functionality varies widely, but the one I use offers patterns of stimulation that last about 30 minutes. Once the unit stops, I peel the electrode patch away, disassemble the unit, and I’m done. • Relief is obvious, if temporary, in the areas where I’ve used the unit. 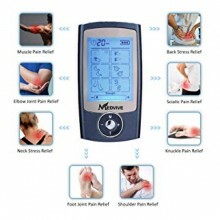 • The TENS unit does not fix the root cause of pain, but it can be used safely, day-to-day. • TENS tends to make me sleepy (must be the endorphins), so I use it at bedtime to enjoy this secondary benefit. If you decide to try TENS, please explicitly follow the directions that come with your unit. They pertain to electrode placement on the body. We’re talking about electrical currents, after all. Some places on the body should be avoided, such as near the heart and chest, neck, spine, or face.